Federal lands are lands in the United States owned by the federal government. Pursuant to the Property Clause of the United States Constitution (Article Four, section 3, clause 2), the Congress has the power to retain, buy, sell, and regulate federal lands, such as by limiting cattle grazing on them. These powers have been recognized in a long line of U.S. Supreme Court decisions. The federal government owns about 640 million acres of land in the United States, about 28% of the total land area of 2.27 billion acres. The majority of federal lands (610.1 million acres in 2015) are administered by the Bureau of Land Management (BLM), U.S. Fish and Wildlife Service (FWS), National Park Service (NPS), or U.S. Forest Service (FS). BLM, FWS, and NPS are part of the U.S. Department of the Interior, while the Forest Service is part of the U.S. Department of Agriculture. An additional 11.4 million acres of land (about 2% of all federal land) is owned by the U.S. Department of Defense (DOD). The majority of federal lands are located in Alaska and the Western states. The United States Supreme Court has upheld the broad powers of the federal government to deal with federal lands, for example having unanimously held in Kleppe v. New Mexico that "the complete power that Congress has over federal lands under this clause necessarily includes the power to regulate and protect wildlife living there, state law notwithstanding." Ownership of Federal lands in the 50 states, including subsurface rights. This map includes as "federal lands" land held "in trust" for Native Americans, which are not generally considered, "federal lands" in other contexts. Lands held by the United States in trust for Native American tribes are generally not considered public lands. There are some 55 million acres of land held in trust by the federal government for Indian tribes and almost 11 million acres of land held in trust by the federal government for individual Natives. Although the United States holds legal title to these lands, the tribe or individual holds beneficial title (the right to use and benefit from the property). As a result, Indian Country is "quasi-private, not public, land." Nevertheless, "because the United States is a legal title holder, the federal government is a necessary part in all leases and dispositions of resources including trust land. For example, the secretary of the interior must approve any contract for payment or grant by an Indian tribe for services for the tribe 'relative to their lands' (25 U.S.C. § 81)." Bureau of Land Management (BLM) - Manages about 248.3 million acres of federal lands as of 2017, more than any other agency. Of these, 99.4% are in the 11 Western states or Alaska. BLM primarily emphasizes rangeland, but also administers lands for purposes other than grazing, including "recreation, ... timber, watershed, wildlife and fish habitat, and conservation." United States Fish and Wildlife Service (FWS) - Manages about 89.1 million acres of federal land, of which 86% are in Alaska. FWS-administered land is primarily for conservation and promotion of wildlife; however, some other uses (such as resource extraction) are permitted under certain conditions and in certain areas. National Park Service (NPS) - Manages about 79.8 million acres of federal land, of which 66% are in Alaska. There are slightly over 417 official NPS units with a variety of titles, including national park, national monument, national historic site, national recreation area, and national battlefield. United States Forest Service (FS) - Manages about 192.9 million acres of national forests. Although Forest Service holdings are mostly in the West, FS also manages about 60% of all federal lands in the Eastern United States. The fifth largest federal landowner is the U.S. Department of Defense, which owns, leases, or possessed 26.1 million worldwide, of which 11.4 million acres are located in the United States. DOD land is mostly military bases and reservations. The largest single DOD-owned tract is the 2.3-million-acre White Sands Missile Range in New Mexico. Together, the BLM, FWS, NPS, Forest Service, and DOD manage 97% of federal land. Federal agencies that control smaller amounts of land include the U.S. Army Corps of Engineers, the Bureau of Reclamation, the United States Postal Service, the National Aeronautics and Space Administration, and the U.S. Department of Energy. Federal land is concentrated in Alaska and the Western United States. 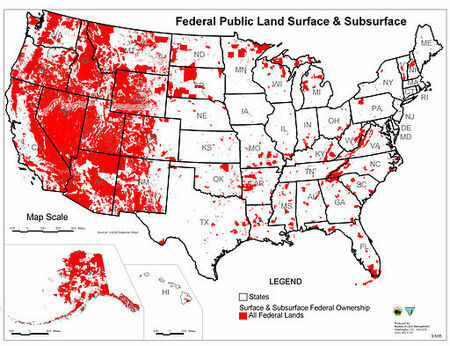 Nationwide, the federal government owns 27.4% of all land area. There are significant variations regionally; the federal government owns 61.3% of the land area in Alaska, 46.4% of the land area in the 11 contiguous Western states; and 4.2% of the land area of other states. The state with the highest percentage of land held by the federal government is Nevada (79.6%); the states with the lowest percentage of land held by the federal government are Connecticut and Iowa (0.3%). From 1990 to 2015, federal acreage declined by about 3.9% due to a decline in land held by DOD and BLM. ^ a b Paul Rodgers, United States Constitutional Law: An Introduction (2011), p. 100-101. ^ Gibson v. Chouteau, 80 U.S. 92, 99 (1872), U.S. v. Grimaud, 220 U.S. 506 (1911), Light v. U.S. 220 U.S. 523 (1911), Utah Power & Light Co. v. U.S., 243 U.S. 389, 405 (1917), Ashwander v. Tennessee Valley Authority, 297 U.S. 288, 336 (1936). ^ Lipton, Eric, and Clifford Krauss, Giving Reins to the States Over Drilling, New York Times, August 24, 2012. ^ a b c d e f g h i j k Carol Hardy Vincent, Carla N. Argueta, & Laura A. Hanson, Federal Land Ownership: Overview and Data, Congress Research Service (March 3, 2017). ^ a b Tom Fredericks & Andrea Aseff, When Did Congress Deem Indian Lands Public Lands? : The Problem of BLM Exercising Oil and Gas Regulatory Jurisdiction, 33 Energy Law Journal 119 (2012). ^ a b "Trust Land" in Treaties with American Indians: An Encyclopedia of Rights, Conflicts, and Sovereignty (ed. Donald L. Fixico: ABC-CLIO, 2008), p. 956. Vincent, Carol Hardy; Comay, Laura B.; Crafton, R. Eliot; Hoover, Katie (November 23, 2018). Federal Land Ownership: Acquisition and Disposal Authorities (PDF). Washington, DC: Congressional Research Service. Retrieved 11 December 2018. Wilson, Randall K. America's Public Lands: From Yellowstone to Smokey Bear and Beyond. Lanham, MD: Rowman & Littlefield Publishers, 2014.